We were surprised by the number of Is that were appearing as corrected misprints and before long had what looked like a suspiciously familiar HONORIFICABILITUDINITATIBUS. 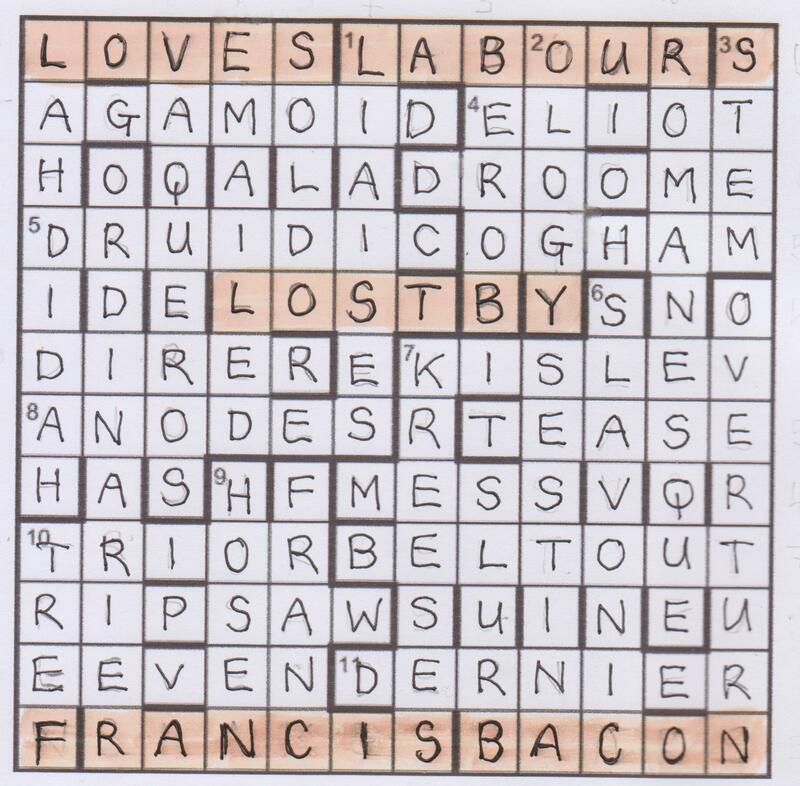 I was on Numpty home ground and it didn’t take long to see that LOVE’S LABOURS LOST was appearing at the top of the grid and symmetrically in the centre with BY and W SHAKESPEARE on the bottom row. So this was a reference to Costard’s word and the Baconian theory of authorship of Shakespeare’s plays. We had the theme. This was great fun and all came together so well. It is certainly one of my favourites of the year so far. Many thanks, Plinth. Right, Friday night, Listener time – and time for a blog! It seems a long time since I’ve written one of these, which just shows how time flies. It was only a few years ago when I used to blog every Listener. I’m sure that readers are grateful for not having to struggle through my entries any more! But tough luck for those who fall into that category, because here goes. Chambers at the ready, pencil in hand, and… let’s go! Okay, it’s Chalicea, which makes this her solo debut – despite her being incredibly prolific elsewhere. Latin title, it seems – At Spes Non Fracta. My schoolboy Latin tells me that this means ‘hope is not yet crushed’. Hmm. That could indicate anything, really. What famous people called Hope do I know? Bob Hope? Unlikely. Hope Sandoval, singer with Mazzy Star? Even more unlikely. Let’s just get on and solve. Quick scan through to see if any clues fall easily. Well, 14ac gives us our first misprint, with a fairly simple to spot EATERY dying to get out from AT in EERY. 15ac looks like an anagram… hmm. Anagram of OR EASTERN gives me, after a couple of minutes of playing, ROWAN TREES, which seems to fit the definition. So there’s a W missing from the wordplay. Interesting. It’s always hard when there’s a mixture of clue types to cope with – in this instance normal clues, misprint clues, and clues where one letter isn’t generated by wordplay. I’m sure this good start won’t last. Anyway, back to more cheery matters. Let’s look at what’s left… Aarrgghh! How did I not spot that before? 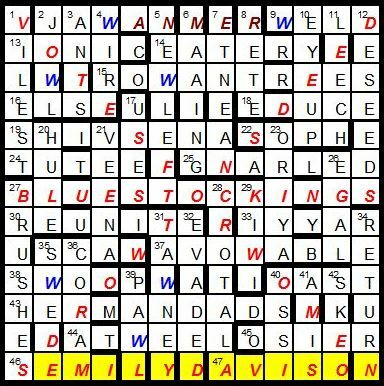 I’ve literally just sat down, and seen that the bottom row reads SEMI?YDAVISON. I’m not an expert on suffragettes, but wasn’t EMILY DAVISON a famous member of the movement? Let’s go and have a quick Google, shall we? 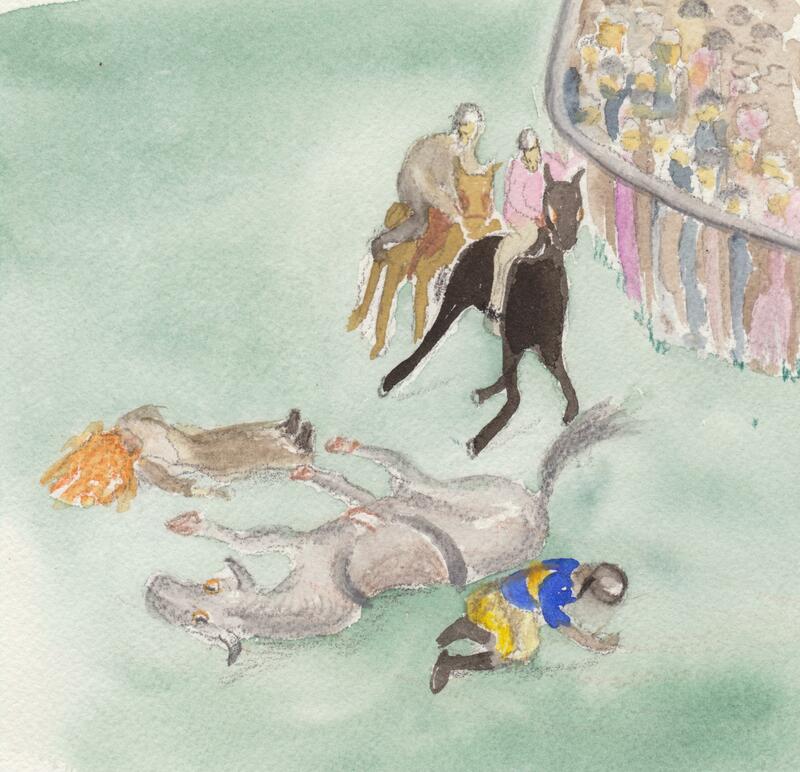 Okay, EMILY DAVISON threw herself under a horse called ANMER on June 4th 1913… June 4th being next Wednesday. That must surely be what we are celebrating then! And yes, at the top of the grid we have ANME? in the centre… yep, if I put RETE in at 8dn, that completes ANMER. Excellent! After that moaning, thank-you to Emma for calling me, and thank-you to Bill and Boris (the cats) for fighting, and meaning that I went outside, and came back to the grid with a fresh pair of eyes. So what else have we got, then? Well the Ws omitted from wordplay must be WOMEN, as I suspected. What else do we have to do? The misprints tell us which of ANMER and EMILY DAVISON must be highlighted, and there’s then two phrases through which lines must be drawn. If in doubt, look at the diagonals… and yes, from NW to SE there is what must turn into VOTES FOR WOMEN. Not so sure about the other phrase, though, although the other diagonal ends with WORDS. WORDS, or is it SWORDS? I suspect my lack of knowledge about the history of women’s rights is an issue here. Let’s solve some more – I’m still conscious that I need to work out what to highlight. Actually, no I don’t – I’ve just realised that CHERCHEZ LA FEMME can be obtained from the corrections to misprints (and ties in with Chalicea’s expert knowledge of European languages). It looks as if the words aren’t split wholly between across and down clues, though, which is a shame. Unless I’m being thick, it would have been better if, for instance, CHERCHEZ had been obtained from misprints in across clues and LA FEMME from those in down clues, rather than CHERCHEZ being split between across and down. Oh well, can’t have everything. 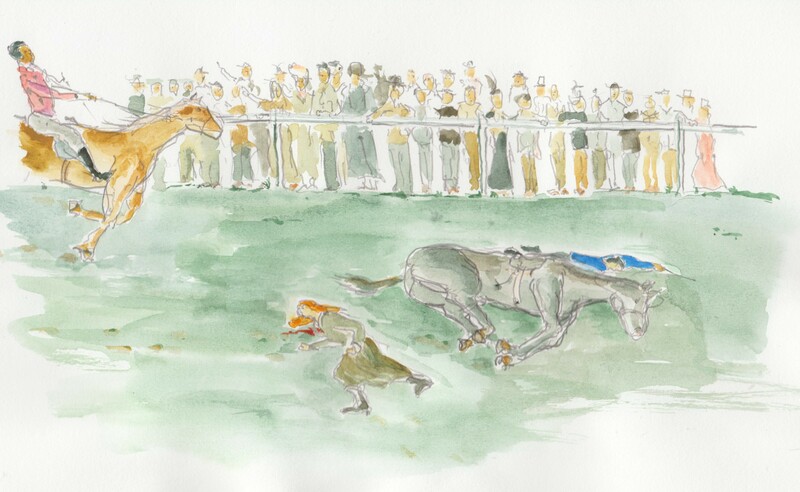 So we know what to highlight – EMILY DAVISON. What about this other phrase, though? Let’s solve the remaining clues. Ten minutes later and we’re done, so about 75 minutes all in all, plus whatever time the cats took up with their antics. The other phrase is DEEDS NOT WORDS, and drawing lines through this and through VOTES FOR WOMEN makes a cross, presumably to represent a cross on a ballot paper. That’s a really nice touch! 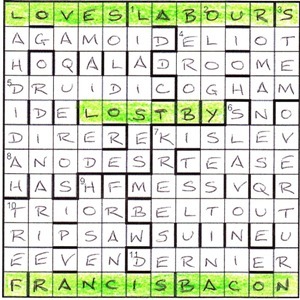 A fairly straightforward puzzle, but lots of thematic touches in there – the Ws omitted from wordplay were a nice thing, and the significance of the cross in the final grid was a joy. Excellent stuff from Chalicea, and proof that a puzzle doesn’t have to be super-duper hard to be enjoyable and a good Listener. As a friend once said to me, it’s harder to set a really good easier puzzle than an average puzzle of average difficulty. This falls firmly into the ‘really good easier puzzle’ category, and I enjoyed it greatly. Here’s to seeing more of Chalicea in the future. One of the cats – I can’t tell which. they look the same – is now on my knee purring, so perhaps he feels the same way.